When Leslie gave me some anaheims she wasn't going to use, I didn't know what to do with them. I had heard people say, "Oh you can throw them in about anything" but I wanted to find a recipe. One was discovered. And guess what? It's basically adding something to cous cous. Although it had great flavor, I'd probably modify it a bit next time by not using as much oil or grain and letting the peppers really shine. And so, I won't repeat for you the recipe I wouldn't repeat for myself. 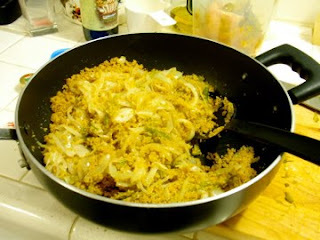 I will tell you to make some cous cous, caramelize onions, and roast anaheims. Although this could be used as a side, I was craving some flank steak to have with it in some tacos with some pico de gallo. Yum. 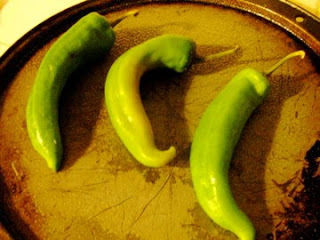 Roasting anaheims, or any pepper for that matter, isn't something you do every day so I think it's worth it to share with you how to do this. Some people would put the peppers over a flame on their stove until they get dark. I put them under the broiler and turned every couple minutes until they were a bit black on each side. 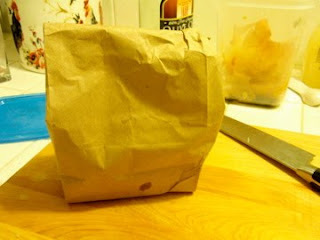 Next, transfer the peppers to a brown paper bag and close up shop. This will make it easier for you to peel of the skin. 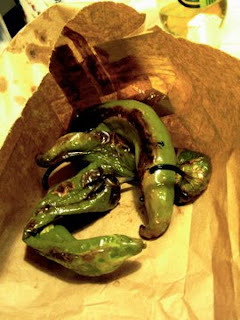 Wait about 10-15 minutes and then take the peppers out of the bag and the skin will peel off. You could do this with some red peppers and put them on a sandwich. Think about how classy you'd be... Cut off the tops and remove the seeds. Slice up and throw them in cous cous, maybe enchiladas for an extra kick, or a chicken or pork dish. Enjoy!